Let me introduce you to Fritz. We adopted him almost 2 months ago from a local GSD rescue and now can't imagine life without him. He was not treated very well in his previous life and was left tied out in a back yard where his collar ultimately wore into his neck. His physical wounds have healed and I don't think he's looked back since his rescue. What he does look forward to are his long daily walks and playtime with the frisbee and whatever else he can conjole you into throwing. He is a happy, sweet, affectionate dog and makes us laugh repeatedly with his childish antics. I'm sure anyone who owns a dog like this knows exactly what I'm talking about. Since we're eternally grateful he's here in our lives (and that we are fortunate to be in his) and since he loves getting his picture taken, it's with great pride that I post his handsome photo. Well, we do have a German shepherd which was also adopted in the same manner. Her condition was so bad when we got her and by taking good care of her, she has now gotten into a healthy condition. Its a wonderful thing you did taking Fritz in as a new family member, I own a female German shepherd she is a blessing to my family she a very loving pet! Wow Fritz is a beautiful looking german shepherd.. it is great to read stories where there is a happy outcome... You will have many great memories with your new found friend. Congratulations on your new family member. Wow, I had not taken the time to view the comments, but I'm so touched by the kind words. Linda and Helene, thanks for the blessings. Dennis, how on earth did you know about the fur!! And finally, Meghann, thanks for the background on our boy! I can't even imagine him being treated, er, mistreated in such a manner and welled up when reading about his sedation and fear. The thanks certainly go to you! 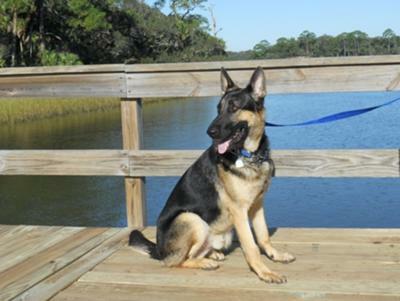 Also Nila is a prize and runs a premium rescue, namely K9 Services German Shepherd Rescue out of Middleburg, FL. You two were instrumental in making this all come together. Everyone's happy, and that's a wonderful thing. What a "Pretty Boy" - Chulo (in spanish). Congratulations for the new addition. He looks happy and you are both lucky to have each other. He has a home of loving family but what he can gave back is Priceless. I don't understand how can people mistreat our precious pets, they will get theirs, God knows. Fritz will be your protector, after all, he's a GERMAN SHEPHERD. God Bless the people at the Humane Society and at the Rescue who took the time to heal him physically and emotionally. Take care of you boy and he will take care of you!!! Great saving and rescue. Our's was actually rescued from ATF. She was too dangerous for the agent's to handle. Now she sleeps with two cats. These are wonderful animals and the look of nobility such as yours is just wonderful. What a great story.. Fritz is a wonderful looking german shepherd. It sounds like he has found a great home. My name is Meghann and I am the rescue coordinator at the Sumter Humane Society in Americus, GA. We are the shelter that received Fritz ( a.k.a. Major at our shelter). Fritz's owner had him chained to a tree where his collar was embedded into his neck. He didn't know the loving touch of a human and he was so scared that animal control had to dart him to sedate him. Wonderful story and what a lucky boy Fritz is. Congratulations.